Good News! ‘The Accidental Wife’ manuscript is complete! I have completed the manuscript of my second novel ‘The Accidental Wife’. Phew! Book Blurb: Dr. Rihaan Mehta is a brilliant young neurosurgeon who has no inclination for love or marriage. According to him wives and girlfriends are annoying accessories that one can do without. But when his mother dangles the sword over his head in classic Bollywood style, he succumbs, and sets in search of a bride who would fit his ‘requirements’. But he could never have prepared himself for what awaits him. Watch this space for updates on the progress of the book– Excerpts, Cover reveal, release date etc. This entry was posted in The Accidental Wife and tagged fiction, life, Love, novel, romance, The Accidental Wife on August 5, 2014 by Packerland. If husband and wife respect the independence of one another, then boundaries and rules become extinct. Just like agreement or acceptance is the body of a relationship, isn’t independence the soul or aatma? Cherish your wife as a blessing sent to you from heaven; let the kindness of your behavior endear you to her heart. She is the mistress of your house; treat her therefore with respect, that your servants may obey her. Do not oppose her inclination without cause; she is the partner of your cares, make her also the companion of your pleasures. Reprove her faults with gentleness; do not exact her obedience with rigor. Trust your secrets in her breast; her counsels are sincere; you shall not be deceived. Be faithful to her bed; for she is the mother of your children. Marriage is all about building trust and so is my book. When Shaan bluntly dismisses Ruhi on their wedding night, he leaves her feeling betrayed and disillusioned. When something like this transpires it is very difficult to regain the trust, despite one’s best intentions and that leads to doubt, misunderstanding and emotional upheaval. This entry was posted in Inconvenient Relations, India Unveiled and tagged Arranged Marriage, fiction, Hinduism, Inconvenient Relations, Indian culture, life, Love, romance, Traditions on December 18, 2013 by Packerland. It was followed by a contact number; simple and to the point. Very unusual for an entertainment company; it either spelt arrogance and self confidence or simply fame. Then out of impulse she brought the card up to her nostrils and sniffed—a distinctive, unmistakably male scent that immediately conjured up an image of a pair of gorgeously seductive brown eyes. She recoiled as if stung and let the card drift to the floor. What am I thinking? A hand drifted up to a rapidly fluttering heart. Control yourself, Khanak… such thoughts are forbidden. Girls such as you don’t think that way, at least not before marriage and not for somebody other than your husband! She glanced at the card as it lay innocently on the floor. Let it lie, she had no use for it. This was her home; where she belonged. Turning the lights out, she settled down to sleep. “But I thought I saw something in her eyes, a hunger to break out of the mold, to become famous! She has it in her Abhay!” He waited till the very last moment before dejectedly joining the line. Like everyday it was greeted with the fragrance of agarbattis and the rhythm of bells; dancing bells which Khanak wore on her feet as she practiced her dance routine. She had done so without interruption ever since the tender age of five when she had begun learning Bharathnatyam. “No matter chachi (aunt), the first and foremost principle of mastering any form of art is practice, practice and good practice, without which the artist will become a langur (monkey) as my Guruji says and I certainly don’t want that, do you?” Khanak laughed. “Yes my dear, you will stay with me always.” Her aunt nodded though without conviction. Khanak was Komal and Sharat Mishras niece. Ever since her parents had been killed in a train accident when she was barely two years old, Sharat (her father’s younger brother) and his wife had taken her in and she loved them as her own parents. They had never differentiated between her and Shreya or their older son Shyam who adored her and was very protective. He was an officer in the Indian Army and had just been promoted to the rank of Lieutenant Colonel. They were all very proud of him. But this morning found Khanak distracted and unable to concentrate. She was feeling unusually irritable and listless. She turned around briskly to see Shreya standing at the door grinning mischievously. “What’s the matter di? You look all red and flustered as though you’ve been caught doing something you shouldn’t.” Shreya sauntered in hiding something behind her back. Khanak ignored her cousin and began practicing her mudras–she had beautifully expressive hands. Shreya watched fascinated. Khanak broke her pose and snatched at the card that Shreya was brandishing over her head. It wouldn’t do for her to spread the word. The whole household would turn upside down. The only reason why she’d been able to continue learning classical dance was because of Komal aunty’s and Shyam’s continued support and only because she had caught the eye of her Guruji as someone who possessed the potential of becoming a major exponent of the art. Her uncle had never been for it. He was a staunch proponent of the old school which maintained that girls from good families do not perform on stage. “After schooling daughters take care of the home and hearth. It is our culture,” he often reiterated. “Aww… but di! What an incredible opportunity! Big city stage, international exposure, name, fame, I can already see your name blazing in neon: Khanak the diva of dance!” Shreya exclaimed, clasping her hands together and gazed dreamily into the distance unaware that she was giving voice to Khanak’s dreams. “Now what are we hiding from chachu? Are we making plans to go to a late night movie?” Komal walked in smiling brightly, bearing a string of fresh mallipoo (Jasmine flowers,) which she attached lovingly to Khanak’s luxurious mane; a daily ritual. “Now my Khanak looks like an angel; Anand is very lucky indeed.” She stepped back to admire her niece whose thick black tresses contrasted most wonderfully with her smooth, glowing complexion and her classically perfect features which she had inherited from her mother. Anand Vaidyanathan and his family had been their neighbors for as long as Khanak could remember. Her senior by a few years; he worked as an engineer for a major software company and was doing very well. Khanak had always considered him a close friend and confidant. “Why is Anand lucky? Are you hiding something from me chachi?” Khanak asked, suddenly anxious. “Bubbly di, Anand and his parents…” Shreya began. Khanak witnessed her whole world come crashing down around her. “But what about my opinion; did anyone care to ask me what I want? Yes, I do like Anand but only as a friend. I don’t love him; for me that is key for a happy marriage. Anyway I’m not interested in all that right now. I want to make a name for myself and I’ve barely begun my journey! Please, say that it’s a joke; a very cruel one but a joke nevertheless!” Khanak pleaded with desperation in her eyes. “But I cannot marry Anand! I cannot!” Khanak collapsed onto the floor. Khanak smiled wanly. She’d always thought she knew Anand very well. She’d never had any inkling of his feelings towards her. Never had he done anything to make her suspect it. He had always been a ready, caring companion and friend— her best friend. This entry was posted in Rhythm & Blues and tagged Bollywood, dance, life, Love, music, R&B, romance, story on November 29, 2013 by Packerland. Yet smother the baby girl? “Can I speak to Shaan?” The voice was female. “Tell him it’s Des. I need to talk to him. He hasn’t been answering my calls!”She had a young but high-pitched voice, a woman who was used to getting her way and who wouldn’t take no for an answer. Ruhi bristled with anger. “You can call back in half an hour. He should be up by then.”She hung up. Soon she could hear him in his room talking and arguing on the phone. She ran into the master and locked the door to shut out the sound. kind. Perhaps it was just his nature, and he really didn’t consider her special. What was certain was that he continued to see this other woman, and Ruhi’s presence hadn’t altered it. Her rival appeared larger than life, and she had lost the fight even before it had begun. “Well, that’s something I cannot say to tell you the truth. You have influenced my taste completely.” He smiled. “Then what are you talking about?” His guard was up. “That’s none of your business. I don’t want to talk about it. Another four weeks and you will be back home. Let’s just leave it at that,” he said, abruptly brushing her off. None of my business. She left the table before she threw her fork at him. The words echoed over and over in her brain like a never ending sermon. She sat on the bed with her knees drawn up; her tears had run dry. No words could be more hurtful or decisive. He had been done with her from the very beginning, and she like a fool had believed that she could win him over by playing the ideal Indian wife. He’d probably been laughing at her all along. I can’t stay any longer, I have to leave now! Papa will get me the tickets. Reaching for the phone, she hesitated. Her parents had no idea about what was going on. She had made a conscious decision to not tell them anything. They would be shocked, heartbroken. She had to break it to them gently, but for that, she would need to stay. But how? Not like this! Pulling off her maroon sari, she stuffed it in the bottom of her still mostly unpacked suitcase. She hated it. Then walking into the bath, she assessed herself in the mirror. If marriage held no meaning for him, why should it for me? If everything was going to come to an end in another month, why not now? Why continue with this charade? Unclasping the sacred marriage necklace from around her neck, she laid it down carefully on the counter. Then, wiping off the vermilion dot from her forehead, she examined her face again. She smiled. Finally, she knew who she was. She was Ruhi Sharma, and there was no looking back. Do you sense a change of pace here? The heroine of my book cannot take it anymore. Ruhi’s done trying and has decided to move on. She chooses to lead life on her own terms. Don’t be deceived by her sweet disposition, or her slender figure for she is ‘Shakti’–a divine cosmic force that can not only create but also destroy. At the base of her spine resides ‘Kundalini’ energy–a powerful goddess waiting to be awakened. She is bold and liberated. She speaks her mind. She is tough and vibrant. She knows what she wants and doesn’t compromise on her values. AND LAST BUT NOT THE LEAST, AS A GIFT TO MY LOYAL READERS I’VE CHOSEN TO PUBLISH AS I WRITE BOOK 2 OF THE ARRANGED MATCH SERIES (THE CONTINUATION OF THE SHAAN AND RUHI SAGA) On WATTPAD— YEAH! Please follow me– TheWriteDoc, read and share your thoughts. I promise you’ll enjoy it! 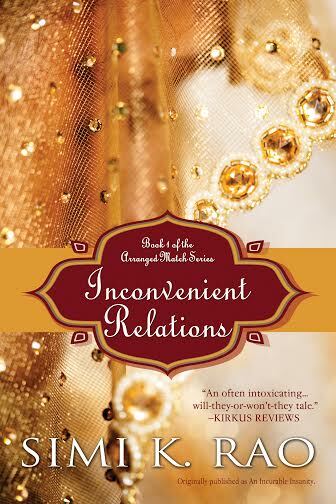 This entry was posted in Inconvenient Relations, India Unveiled and tagged Arranged Marriage, Book 2 of the Arranged Match Series, culture, Divine woman, Exotic Tour, fiction, Freedom, Giveaway, heroine, Inconvenient Relations, Indian culture, literature, Love, Now and Forever, romance, Shakti, Wattpad, woman on October 25, 2013 by Packerland.